Creation of an additional slope for water removal from parapet wall (counter-slope). TECHNONICOL XPS 35 300 CARBON SLOPE’s cutting edge is the wedge-shaped slabs set that makes it possible to create slopes and small-angle sloping on floors at roofs, increase slopes through re-construction of the existing roof, create small angle sloping in the valley to divert water to the inlet funnels, in ventilation shafts and skylights, through arrangement of an extra slope so as to lead the water away from the barrier wall. 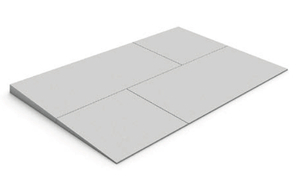 TECHNONICOL XPS 35 300 CARBON SLOPE solves the problem of stagnant zones with optimal slopes on the roof. Slabs should be stored in a dry closed place, horizontally in piles at a distance of not less 1 m from heaters. The piling height should not exceed 5 m. The width of spaces between piles should be not less than 1.5 m. Slabs should be stored under an awning, protecting them against atmospheric precipitation and sunlight. When storing under an awning, the slabs should be laid on pallets or linings.